Sisterhood is a word that has meant many different things throughout the ages and throughout the history of the Conservative movement and in the evolution of Temple Israel itself. While Sisterhoods have disappeared from many Conservative synagogues, ours continues to be a robust and much venerated organization within our congregation. One reason for its strength is the versatility and commitment of Sisterhood members. We range in age from our 30s to our 80s and represent a wide range of professions and backgrounds. Open to members and non-members alike, Sisterhood has often been a gateway for women in the community to reconnect with or rediscover Jewish life, eventually leading their families to formalize their ties through membership in our congregation. Please join us to experience this sense of sisterhood for yourself, and become a part of a group of interesting, welcoming, dynamic women. New Temple Israel members are entitled to a year of free membership in Sisterhood. After the first year, members pay $36 a year and non-members, $54 a year dues. Gift Shop – Hostess gifts, baby gifts, Judaica for all occasions, locally crafted and imported from Israel; tallitot, kippot — you name it! The Sisterhood Gift Shop is open on selected Sundays every month and by appointment. Volunteers needed! Contact Stephanie Gottesman to volunteer or to make a purchase: (201) 444-4778 or sjg1234567@aol.com. Torah Fund – This an international fundraising campaign ensures our legacy to future generations of Conservative Jews by Women’s League. Each year, an artist designs a beautifully crafted Torah Fund pin to give to those who donate $180 or more. Torah Fund cards offer an appropriate way to mark all special occasions and cost $5 each; 100% of all donations benefit Women’s League Torah Fund. To donate or order cards, contact Susie Goldstein at 201-444-4704 or susieg70@aol.com. Kippot for your Simchas – Sisterhood continues its tradition of selling custom-made kippot. Before you place an online order for your next simcha, check with us–you’ll save money AND benefit the synagogue. 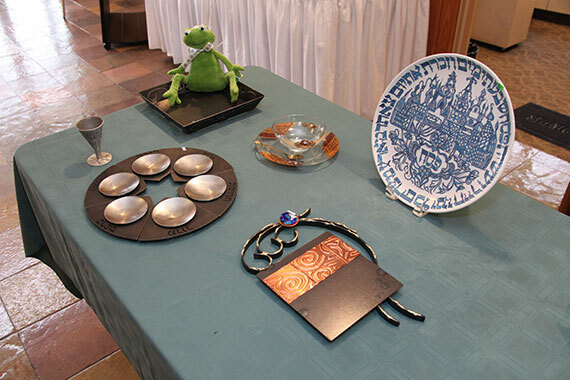 Contact Carla Vogel at 201-670-1642 or Carla@synagogue.org.